PLEASE WATCH THIS. APOLOGIES FOR THE LENGTH OF TEXT, BUT PLEASE READ & SHARE THIS (via copying and pasting or going to Clwyd South Labour Party Facebook page if you can’t share from here. Thank you). Video is from approx 8mins 35 secs in. Another superb report about the Save the Welsh Independent Living Grant – WILG campaign by the BBC’s Paul Martin, who again puts his UK-level colleagues to shame by showing how journalism should be done. With Plaid securing a debate on WILG on Wednesday in the Assembly, we at Clwyd South Labour Party & Labour for Wrexham join our MPs Susan Elan Jones MP & Ian Lucas in calling on the Welsh government, OUR party, to finally make the change that absolutely NOBODY (apart from seemingly some Cabinet Ministers), ANYWHERE-inside or outside Labour-is against! Both Mark Drakeford AM & Julie Morgan, Assembly Member for Cardiff North are good people, who we campaigned, phonebanked, door-knocked & supported passionately during their respective campaigns; both have been openly supportive of what we are trying to do. -via FOI, VERY clearly, without a shred of doubt, the evidence in black & white shows that the current system implemented last year is failing lots of people. Demonstrably so. We have pages and pages of evidence and reports that prove that, putting all emotional pleas to one side, NOT keeping WILG with Tripartite is demonstrably worsening the lives of many, while as Dame Tani Grey-Thompson says, the inevitability of it costing MORE by NOT doing this! Add to this we have plenty of evidence of what happens when the WILG equivalent is kept as in Scotland & Northern Ireland (very successful) V when it is scrapped, hence WILG to begin with, in England-i.e. Terrible results for the most vulnerable. Not surprising given this is, no matter how it is dressed up & accepting it was not the original intention, very clearly a Neo Liberal policy-the antithesis of what we stand for in Labour. -NONE of the recipients are creating a two-tier system. WAG is. Both at the initial stage-their choice, but also now with the wildly differing results from Local Authorities. THAT is a two-tier system! Also, the number of recipients is only going DOWN, so if WAG do not think it is obvious that THE most vulnerable people in Wales deserve their direct protection (Tripartite), then we would love to know why. -Democracy: We are very pleased to see Mark Drakeford re-emphasizing how we are a democratic, member-led party in Wales. Therefore, we expect, obviously, that the vote at Welsh Labour conference 2018 is upheld and that we keep WILG with a Tripartite system. Otherwise, as one of the first acts of the new administration, it’s not exactly a good look if the largest ever defeat for WL is ignored given the committed stance on democracy!!! Many would question what the point of conference motions are if this is ignored. ALL other political parties in Wales. ALL! Do we need to go on? We repeat, we have faith in both Mark Drakeford & Julie Morgan to do the right thing as they are good Socialist people. IF, and we say IF, this is a failure of consensus politics, then annoy those objecting in your cabinet. Not the most vulnerable people in Wales. IF this is being stopped by the egos of others, because OBVIOUSLY it is not based in evidence, is it? !, then I am afraid WE, because WE are Labour, MUST stand up to anyone wishing to block what is an ABSOLUTE NO-BRAINER!!! To be clear-our campaign will only heap praise on Mark Drakeford, Julie Morgan & Welsh Labour if they secure what is ethically, economically, politically & procedurally the right thing to do. We will praise them for listening and PROVING this new administration is a listening one, that it is very much a Socialist one, and very much an administration that respects democracy. It will be a statement of intent. It will, to quote Rhodri Morgan, show “Clear red water” between the Tories in Westminster & Labour in Wales. Nathan & the campaign has done everything by the book, jumping EVERY admin/democratic hurdle. Now with this democracy-centred, inclusive, Socialist administration in addition to all the glaring, factual evidence, NO OPPOSITION either internally or externally, the UK Leader & Shadow Chancellor, the UN, Welsh MPs & AMs, THE CONFERENCE VOTE etc etc…This really is VERY easy to do from every conceivable angle-morally, politically, economically, PR-wise etc. It should be like shooting fish in a barrel. On behalf of the campaign, please do not make us have to, either. Do the right thing. You are good, decent people who we are proud to campaign for & defend daily. Yes, no one says your job is easy-far from it. But this decision is. PLEASE, before the party we love gets exposed in the Assembly on Wednesday, PLEASE LISTEN. THANK YOU! This is an incredibly worrying time for all disabled people and their families across Wales. There are only 63 days left before the Welsh Independent Living Grant is due to end, leaving individuals at the mercy of cash-strapped Local Authorities who seem intent on cutting vital support packages across the board with no guarantee that further cuts will not follow. The fact that this neo-liberal policy is still being forced through by a Welsh Labour Government is unbelievable: frankly, it makes it even worse. I always thought that I would be protected from the brutality shown by the Tories in Westminster, because I live in a land governed by a social, democratic party. Unfortunately, the Party that I know and love seem to have lost their way under the previous leadership, which is why I was overjoyed by your election victory to become our new First Minister. …”if an independent evaluation “shows the new system is not working as well as the old one then I would be prepared to reverse it because this is money intended for a very specific number of people for a very specific purpose”. The deep-dive that was recently undertaken by the Welsh Government, to analyse the performance of Local Authorities relating to the WILG transition, is full of errors and quite frankly not worth the paper it is written on. How can an investigation into the circumstances surrounding the end of WILG be conclusive without having consulted disabled people who will be affected? My comrades dismantled the deep-dive results in our recent meeting with Deputy Health Minister, Julie Morgan AM. The closure of the Welsh Independent Living Grant is such a destructive move to disabled people’s rights and I do not believe that a progressive Party such as ours should be going down such an avenue. #SaveWILG campaigners have presented the Deputy Health Minister with an 80 page dossier of evidence against the closure of WILG. In addition, we have the backing of Welsh Labour members who overwhelmingly voted in favour of the Clwyd South motion to save WILG at Conference in April 2018. I believe you pledged to listen to the voices of members during the Hustings and they have certainly been vocal on this subject. We have also had support from Jeremy Corbyn, Shadow Chancellor John McDonnell, MP’s such as Chris Williamson, Ian Lucas and Chris Ruane. Film Director Ken Loach also supports our campaign. However, various disability organisations in Wales had advocated setting up a national independent living scheme in Wales as aligning with a citizen directed system of support rather than the approach now adopted by the Welsh Government. How it reached a decision to move all ILF recipients to normal social care provision from 31 March 2019, rather than setting up a national independent living scheme? How it will ensure protection for article 19 rights of those formerly eligible for the Independent Living Fund after 31 March 2019? I do not believe Welsh Labour should be having to defend themselves against the UN as I know your personal intentions are to ensure universal equality throughout Wales, but now is the time to take positive action and start listening to Welsh Labour members and disabled people and their families. Personally, I have been treated abysmally by my Local Authority. I find myself in the position of having to teach my social worker about the Social Services and Well being Act. I am not being allowed to use my Direct Payments to meet my Personal Outcomes as described in the SSWBA and feel this vindicates my insistence on the need to maintain the tripartite system when deciding on and funding future care provision. The reassessment process – which was originally due to end by September 30th 2018 and shows no sign of being completed soon – is really having a negative impact on my physical and mental health. When I first met with my social worker at the end of November 2018, she laughed when I suggested that I would need 24/7 support. She declared that no one in Wrexham gets such a thorough level of support [whether they require it or not?]. She said that even if we applied for such levels of care and support, that the panel would not accept such a request. This is a total departure from what the SSWBA promises. There is definitely no co-production going on and Local Authorities seem to be treating disabled people as a burden. Without the overnight support I need to fully function in society, I have to stop drinking at 8pm at night, get ready for bed at 10pm and cannot wear my hand splints or use my leg supports during long and uncomfortable nights. I often find myself having to call on my 68-year-old father to assist me in the night, even though he lives a 10 minute drive away and has arthritis in both hands. As Tanni Grey-Thompson said on Wales Live (23/01/19), it will cost the Welsh Government more in the long term to push ahead with this strategy of devolving funding to Local Authorities. It just makes no sense whatever way you look at it. Disabled people and their families never wanted such a situation to develop as was indicated in the original consultation that took place during 2015/16. I have been asking to see the consultation documents since October 2017, but I keep being directed towards a summary document. We all know that a summary can be manipulated and edited to suit the publishers. If the summary is accurate why can I not access original consultation responses? It is often claimed by the Welsh Government that the original stakeholder group were united in agreement with the closure of WILG and the transferring of funds to local authorities.This is quite simply untrue. The members of the stakeholder group that I have spoken to have stated their frustrations with the whole process: “I disagreed with one side of the room almost continuously,“ and “I would be amazed to see minutes of a meeting where all participants agreed that passing this WILG over to the local authority beyond the ring-fenced period was the way forward.” Others have said “I used to go home from all these stakeholder groups thinking we had agreed certain things to discover that was not what had been recorded.” and other activists argue that many officials and civil servants do not actually “know what Independent Living means – they still think ‘independent’ means managing without support”. It would greatly assist me in understanding Welsh Government’s decision making process on this issue if the minutes of all of the meetings of the stakeholder advisory group can be provided, and I will submit a Freedom of Information Act request if necessary. I could go on and on, but time is against me and I would merely be repeating much of what can be read in my attached dossier of evidence. At over 80 pages long, I believe it is a comprehensive guide as to why the Welsh Independent Living Grant should be maintained indefinitely. The dossier includes information of the success of the Independent Living Schemes set up in Scotland and Northern Ireland that shows the lack of imagination shown by the Welsh Government compared to our neighbours. Please note that this letter is written with the deepest respect towards yourself and your cabinet members. I am a loyal Welsh Labour supporter and I have belief in the 21st Century socialism that you intend on developing. The problem is that we cannot wait any longer and the changes need to be made immediately. There is no sense in a proud socialist Government copying the exact same model rolled out by the Conservative Party in Westminster. Moreover, if the original decision was wrong then your team needs to have the courage to simply reverse it. Tinkering with the detail in a bid to spare the blushes of your predecessors is just not acceptable: in fact it’s morally dishonest. I know that you are extremely busy with Brexit and other pressing concerns, but disabled people with high care and support needs across Wales are in need of your leadership now. I look forward to meeting you again in the near future and should you require any more information from the #SaveWILG campaign, please do not hesitate to contact me. Journalist Paul Martin really has played an important part in the #SaveWILG campaign by increasing awareness of the issue with the general public. He has always delivered well balanced articles that clearly show the failings of Welsh Government policy and Local Authorities. His latest article on WILG can be read below or by clicking this link He has also produced a feature that will appear on BBC Wales Live this evening (23/01/19). 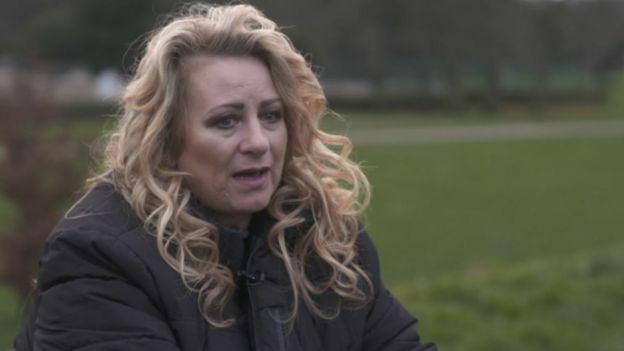 A woman who cares for her severely disabled brother has said funding cuts have negatively affected her life, as pressure to change the system grows. Jayne Newman, from Newport, said she was given “no reason” for a loss of support, which saw 15 hours of care for her brother Tommy cut. MP Ian Lucas said changes to support for people who used to get a special grant were causing “real distress”. Newport council said Mr Newman received a “generous” support package. The Welsh Independent Living Grant (WILG) was introduced in Wales to replace the UK-wide Independent Living Fund (ILF), which was closed down by the UK government in 2015. But WILG is being scrapped and the funding and responsibility for more than 1,000 people who received it transferred to Wales’ 22 local authorities, leading to fears of cuts to support. More than 100 of the first 600 people who were assessed by their councils had their support reduced. Ms Newman, whose brother lives with her, said she was given “no reason” for the cuts of 15 hours per week, which equates to paying a carer for an overnight stay and five hours of day care. “He needs total care, so he needs to be washed, dressed, shaved,” she said. “He is now on a liquid diet which means it’s a bit like having a baby, we’ve got to give him hourly feeds to maintain his weight and wellbeing. “As long as somebody is there he doesn’t really understand whether it’s me or one of the carers, so he doesn’t understand that the cuts have made a difference to my life. “It’s like I have to be in every night by nine o’clock. I still want to have a life as well as look after my brother. But Newport council said Mr Newman’s care package was “over and above” what he would have been allocated as a new case. A spokesman said: “Although certain elements of the original package of care have been removed, they have been replaced with a more flexible package. The minster responsible for overseeing the transition from WILG to council-run support, Huw Irranca-Davies, left government in December in new First Minister Mark Drakeford’s reshuffle. His replacement as deputy minister for health and social services, Julie Morgan, called for a review of the policy while on the backbenches, and Mr Drakeford said during his leadership campaign changes would be made if people were losing out. Mr Lucas, the Labour MP for Wrexham, suggested a possible solution could be for those who have lost out to apply for a top-up from Welsh Government. “I don’t think we’re going to have the same scheme that we had previously but I do expect a big improvement in the scheme as it exists at the moment,” he said. “I think this is causing real distress for people who need help. Welsh Government emails seen by BBC Wales Live show government officials were told by a “number” of councils “the overall cost of the support provided to people who have transitioned (to council funding) is more than the WILG funding transferred (from the Welsh Government to councils)”. The Welsh Government said it was “reviewing progress rigorously to achieve a fair outcome” for all. “It is paramount that a person’s ability to live independently is not compromised by the change in the way care and support is arranged for people previously in receipt of the WILG,” it said. It added all money had been passed on to councils, and none had been reclaimed despite the number of eligible recipients falling. Wales Live is on BBC One Wales at 22:35 on Wednesday. I have received the following letter from Huw Irranca-Davies AM, Minister for Children and Social Care following our meeting last month. I was disappointed with my performance at the meeting and now I am disappointed with the letter that the Minister has sent. It is the sort of letter we’d expect to get from a government minister; it appears detailed and thorough, but it seems to avoid the reality on the ground. Thank you for meeting me to discuss the Welsh Independent Living Grant (WILG) and for sharing your experiences and concerns. It is important to me to see how the decisions we make as a government are translating into delivery for people on the ground. As we discussed, I am writing in response to some of the points which were raised, and to give you an update on further actions. At our meeting you explained that you thought there had been separate public consultations held in 2014 – one for recipients and the third sector, and another for local authorities on the principle of four potential options for future support arrangements for former recipients of the Independent Living Fund (ILF). I would like to assure you this was not the case. Only one consultation was held with all the responses considered together. You also raised the issue of accessibility of the consultation for recipients. To address this issue various versions of the consultation were produced including a Welsh language version, a braille version, easy-read and easy-to-read version. The latter versions were produced with assistance from the RNIB and Learning Disability Wales. I understand from my officials that a large number of the easy-read and easy-to-read versions were issued where recipients and their families felt these would aid their understanding of the consultation. On the substantive issue of a scheme to succeed the ILF, you asked why the option of a Welsh Independent Living Scheme put forward by Stephen Harris of the Dewis Centre for Independent Living was not considered further, as you believed this option received most support from respondents. However, as the consultation summary indicates, the most supported option was in fact the potential for arrangements in Wales similar to that of the ILF. As Shiela may recollect as a member of the stakeholder group who advised Welsh Government, when the detail of how a resulting shortlist of options could be implemented that option was indeed considered further. However, the Welsh Independent Living Scheme option did not make that shortlist for several reasons. While on the face of it the scheme would adhere to the principles behind the establishment of the ILF, many opposed it as the funding would not go to the individual but to their local authority to fund the cost of their care package. The only way under this option that recipients could continue to have control over the support payments they received would be through direct payments from their local authority. In addition many were concerned that the increased numbers of disabled people in Wales, who local authorities could claim funding for from the scheme, would result in the threshold to access this system having to be set at a very high level in order to make the scheme affordable. This was in light of the fixed, finite funding the UK Government transferred to the Welsh Government to fund the support of former recipients of the ILF. This could have had the potential to reduce the funding the scheme could provide to authorities in individual cases. In view of these concerns Ministers at the time concluded it was not suitable to pursue this option further. It is important to emphasise that the decisions taken in consultation with the stakeholder group have at all times sought to ensure people with disabilities in Wales have the right to live independently at home and are supported to do so. As a government we have acted to underpin this in legislation through our Social Services and Well-being (Wales) Act 2014. The Act is changing the way people are supported to give them more voice and control over the care and support they require to meet their own wellbeing outcomes. It is encouraging to see increasing evidence of this approach becoming standard practice across Wales to the benefit of those who rely on support, and with a positive effect on the future support packages which are being agreed for WILG recipients. We also discussed the monitoring of the two year transition period, where I confirmed we collect periodic data from local authorities on their progress. As of November last year over 350 recipients in Wales, of the 1,300 recipients in total, were already in the process of agreeing their future support package with their authority, with over 30 having now decided to transfer to receiving their support through their support package. While this is positive, I agree we need to widen this monitoring to also collect qualitative data on the outcomes which WILG recipients are experiencing, and I am currently considering ways in which this could be done. In addition I am acutely aware if we are to support recipients to live independent lives, authorities need an appropriate amount of time to undertake reviews with them and for recipients to have time to agree their future support packages do this. As a result I am also considering whether there is a need to adjust the transition to allow authorities more time to complete these reviews given the numbers involved and the fact that a large number of recipients have complex care needs. Finally, you raised several concerns about the approach of Wrexham County Borough Council to care assessments and to the transition process for recipients of the WILG to local authority support. In the light of your concerns my officials will seek direct assurances from the local authority over its implementation of the transition process and its reviews of recipients’ future support needs. I will write to you again with a progress update on the transition to the new support payments, including any potential changes for the transition and the monitoring of the transition, and response to your concerns over local implementation. In the meantime I am copying this letter for information to both Ian Lucas MP and Sheila Meadows, and I thank you again for taking the time to meet me and discuss these important matters. I WILL BE RESPONDING TO THIS LETTER OVER THE NEXT FEW WEEKS. MY RESPONCE WILL BE PUBLISHED ON THIS BLOG IN FULL. Loads of things to let you know, but so little time. I have been working alongside Nathan Davies, a party member here in Wrexham, over the changes the Government has made to the Independent Living Fund. 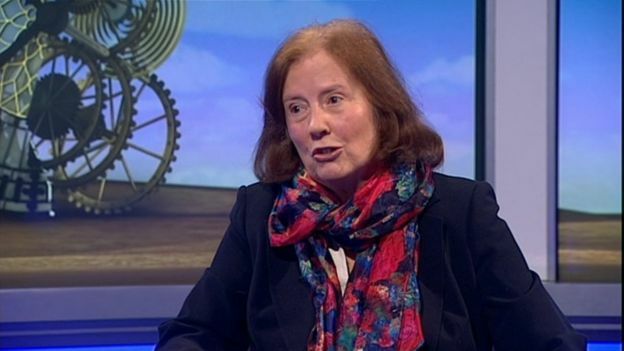 The debate included MPs from Northern Ireland, Scotland, and England as well as Welsh Labour colleagues Susan Elan Jones and Jessica Morden, and it was notable that each part of England criticised the changes the UK Government has made to the administration of the successor to ILF. I was able to pay tribute to the work Nathan has been doing – and to highlight his front page appearance in the Leader that morning. I was not particularly impressed with the Minister’s response, although I will take her up on her offer to meet to discuss my concerns. I think we have established how brilliant I am, but this awesome individual is also struggling at the moment with the effects of Friedrich’s Ataxia. This cruel disease is progressing quickly and really starting to affect my swallowing and speech. I have particular problems before food as I am regularly coughing and choking uncontrollably on my own saliva as I anticipate my food. Another problem is with my speech. I am afraid that I am beginning to slur more than I use to and I just cant bear listening to myself on TV or radio as the voice that I hear is not the one that I hear in my head when speaking. I really should do something about both problems, but as I am so busy trying to save WILG, I am letting my health slide. Earlier this week, I received a phone call from the local hospital asking me to come in for a camera down my throat following discussion with my GP about my difficulties choking. I chose to decline there kind offer as I am so busy with other things and cannot afford to lose my voice or become ill at the moment. I received a newsletter from Ataxia UK today informing me of a speech and language therapy course that they are running in association with the University of Stirling. The second are all taking place through Skype so they are open to everyone. I really should take part and I would like to if only I had the luxury of time to spend looking after myself. The Tories and Wrexham council are ensuring that this is just not possible at the moment. Communication problems are a frequent consequence of ataxia. Many people report a decrease in quality of life as they can impact on our social relationships, employment opportunities, etc. Yet there currently is no effective treatment for speech problems that has been properly evaluated, and there is uncertainty amongst clinicians on how best to support people with ataxia with their communication. We are looking for participants for a study investigating a new treatment approach for speech problems. There is good evidence that this approach is effective for Parkinson’s Disease and we want to find out whether it can also help those with ataxia. This study is funded by Ataxia UK and aCHaf and carried out by researchers at Strathclyde University in Glasgow. The treatment will be administered via Skype in your home and there is no need to attend a clinic. It will run for 8 weeks, with two therapy sessions per week and homework practice for the other days. A typical LSVT therapy session will involve practising a good voice production on a series of long ‘ahhhs’ focusing on controlling the loudness of your voice, as well as the pitch. We will then try and transfer these skills to speaking by reading out individual words and functional phrases, working our way up to longer stretches of speech over the course of therapy. As treatment will be carried out in English, it is important that you have Basic English speaking and reading skills. This protocol of activities will be the same for each session, but the materials will increase in complexity. Homework exercises will follow a similar protocol to the therapy sessions and will take about 30 minutes. Ideally, we would like you to practise at least another four times during the week. We will measure how much your speech has changed after treatment, and also ask you what youthought of the therapy approach. To do this, we will perform two short assessments before and two after treatment, and also do an interview. This will again be done via Skype. Altogether, the study will take about 6 months. I should probably email Aisling to find out more information. I cannot end this blog without mentioning the two events that have on this week. The first of which is a #SaveWILG Art exhibition at Theatr Clwyd in Mold, north Wales. 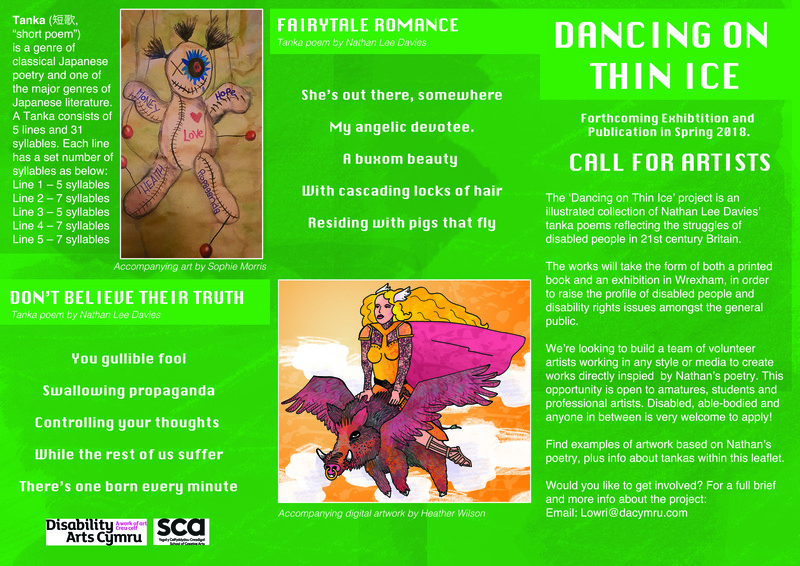 This event runs from January 24th to February 12th and includes art, poetry and pictures from a wide range of disability activists and artists. The official media day for this is on February 2nd. I am very proud of what we have put together in such a short space of time. A leaflet for the Theatr Clwyd event has also been produced by Heather Wilson. Our North-East Wales WLG/M comrades are centrally involved in organising this great event. It will be a fantastic occasion, but we need to get as many people there as possible! This is a day of entertainment and information. There is alcohol, soft drinks and food on sale at the venue and there is full Disabled access and a Disabled toilet. The least we hope anyone can do is promote this event by sharing the flyer and printing it off and putting around your area, disability groups, CLPs etc etc. Raising awareness of the event is crucial to the campaign’s success!The event is FREE to all. Please do help in any way you can. I am also looking forward to the following two events which I am busy trying to organise. The first of which is a #SaveWILG Art exhibition at Theatr Clwyd in Mold, north Wales. 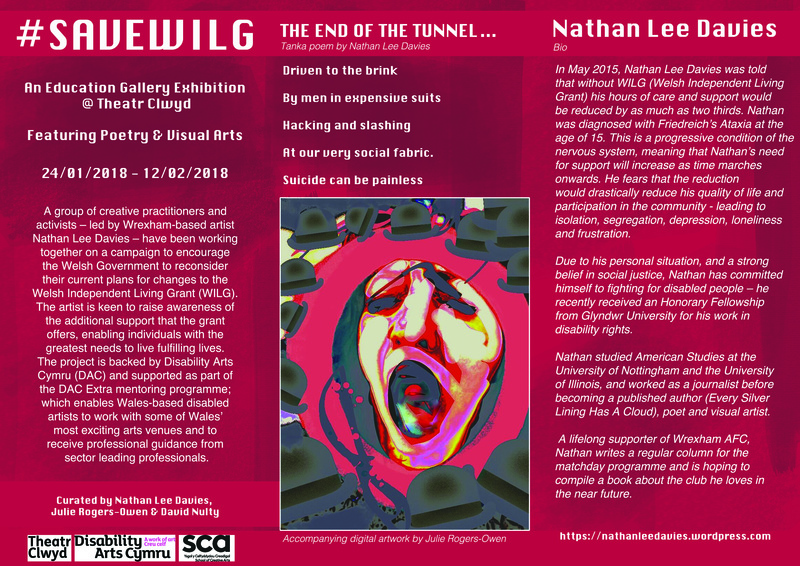 This event runs from January 24th to February 12th and includes art, poetry and pictures from a wide range of disability activists and artists. The official media day for this is on February 2nd. I am very proud of what we have put together in such a short space of time. Our North-East Wales WLG/M comrades are centrally involved in organising this great event. It will be a fantastic occasion, but we need to get as many people there as possible! This is a day of entertainment and information. There is alcohol, soft drinks and food on sale at the venue and there is full Disabled access and a Disabled toilet. Some of our comrades are performing, but we would love to hear back from you or anyone you know how is in any way creative and/or a performer. 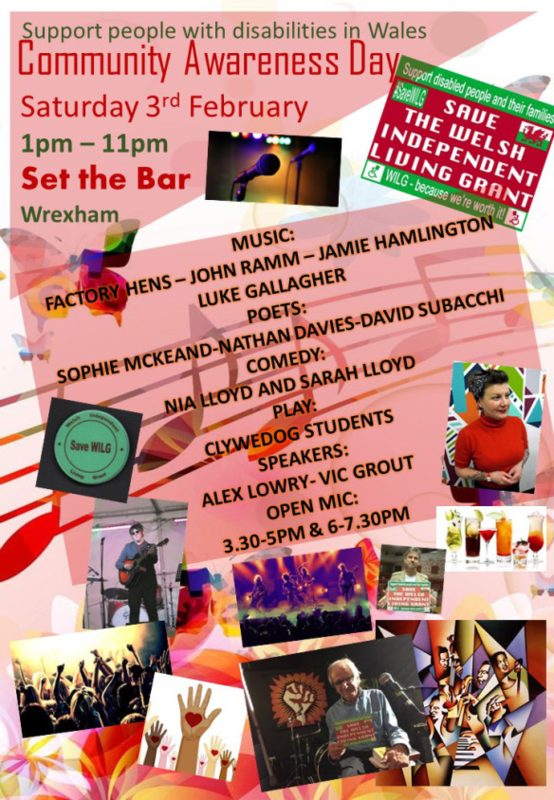 Please do get in contact with either Vic Grout (vic.grout@glyndwr.ac.uk) or Louise Bosanquet (louise.bosanquet@hotmail.co.uk) if you would like to perform or know someone who would. The least we hope anyone can do is promote this event by sharing the flyer and printing it off and putting around your area, disability groups, CLPs etc etc. Raising awareness of the event is crucial to the campaign’s success! The event is FREE to all. Please do help in any way you can! The following notes where typed up by Sheila Meadows OBE following are meeting with Huw Irranca-Davies last week. As time goes on, I regret not saying certain things and holding him accountable for his party’s failings over the past few years. This is why I am trying to set up another meeting in Cardiff with the honourable gentlemen. A Social Worker visited NLD in 2015 and informed him that without WILG the council would be looking to reduce his hours of support. NLD explained he had a progressive condition and requires additional support not less. He explained his fears for the future. NLD described his involvement in the community and states his campaign is formed from a desire to help all WILG recipients have positive outcomes. NLD feels targeted by Wrexham Council as a disabled person (Social Care cuts/Blue Badge issues) and is frightened of the future. NLD explained the need for an independent third party that can fulfil the role of ILF in providing information and support in dealing with the council to give uniformity across councils. NLD requested that the minister take this opportunity to achieve something better for disabled people, not just WILG recipients. Huw Irranca-Davies (HID) discussed the history of the consultation process, Steve Harris’s 4th option and was given notes sent by Steve and the Wrexham consultation notes. He accepted there had never been complete agreement in the stakeholder group but was clear he wanted every penny of the £27 million to go to the care of former ILF recipients to maintain their independent living. HID is also aware of the problems facing disabled people in England. HID was clear that he had no intention of changing policy, but was also clear that he expected LAs to be assessing fairly to meet needs. Under the SSWBA, ALL people should be supported to achieve the outcomes they require for their mental and physical health. Ian Lucas (IL) pointed out that when an urgent letter was sent to Wrexham council in November, far from supporting recipients by making contact and reducing anxiety as requested they had merely filed it. He has no confidence that Wrexham LA will come forward to produce a process or plan for meeting the high level of needs of this group of disabled people. There was a wide discussion on how and who takes responsibility when a LA does not, or cannot meet the requirements of the WG. NLD explained how he felt during initial discussions with his social worker last month. She laughed when he suggested he needed 24-hour care and knew the panel would reject such a request out of hand. NLD feels far from working with him to meet his needs, he is seen as an inconvenient nuisance by Wrexham council. HID and Matthew Hall (MH) confirmed the policy was not to reduce the support people have but to meet their needs to continue to live in the community. MH has agreed to send a follow up letter to NLD and Sheila Meadows (SM) once he has spoken with HID – who has now left the meeting. NLD and SM also reinforced the loss of the knowledgeable and supportive body we had in ILF and MH agreed to consider how to ensure an LA who is not performing well will be forced/supported to move forward.